Blizzard and whiteout conditions are the cause of a slew of crashes Thursday afternoon, RCMP say. 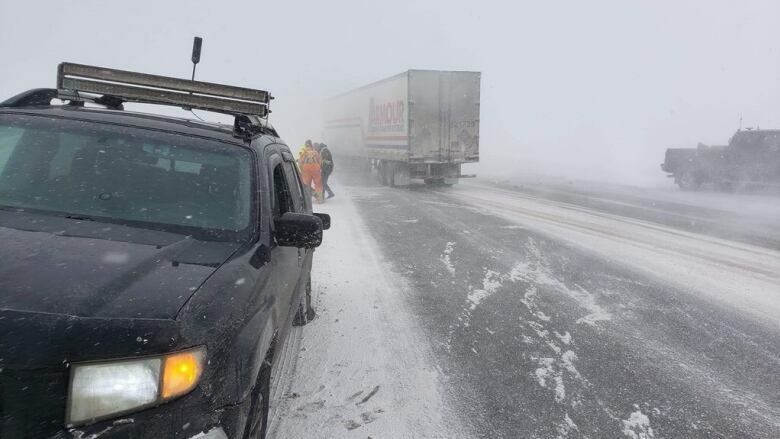 Blizzard and whiteout conditions are to blame for multiple crashes near Stephenville Thursday afternoon, and even an ambulance responding to one collision was involved in a crash, RCMP say. Bay St. George RCMP got four calls between 3:15 and 4:35 p.m. Thursday about collisions in different areas. The first around 3:15 was on the Trans-Canada Highway and involved a transport truck that had jackknifed, and was struck by two vehicles. By the time officers were able to get to the scene in the weather conditions, the vehicles had all left the area, and no injuries were reported. The second crash around 3:30 happened near Gull Pond and involved a truck and a smaller car, but no injuries were reported. There were minor injuries in the third crash involving two vehicles, around 3:45 near Black Duck Siding, and people were taken to hospital. And there are few details about a fourth crash in the Gut Bridge area, but no injuries were reported. An ambulance was responding to one of these crashes around 3:30 p.m. when whiteout conditions struck again. The ambulance got caught in that weather and struck another vehicle from behind, with minor injuries reported, RCMP said. Cpl. Jolene Garland says the RCMP had issued a traffic advisory at the time the blizzard hit, and the hope is that drivers will heed those warnings to stay off the road. "If you know of an area in your community that is particularly prone to whiteout conditions when snow is blowing around, probably go a different way," Garland said. "If you can avoid it, take an alternate route, then you should do so."